A new Gay Pride design, printed on T-shirts, spotlights the achievements of GLBT celebrities throughout history from Michelangelo to Rock Hudson. Developed by award-winning playwright, Janet S. Tiger, the T-shirt lists 27 important gay celebrities and is based on scholarly research. What do Michelangelo, Florence Nightingale and Rock Hudson have in common? 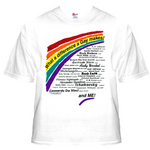 They are all featured on a new T-shirt design, "What a difference a Gay makes" which spotlights the achievements of GLBT celebrities throughout history. The slogan is superimposed on the "freedom rainbow” and features 27 gay V.I.P.’s. “After being in theater for many years,” said award-winning playwright Janet S. Tiger, designer of the shirt, “I’ve had the opportunity to work with many talented individuals in the gay community. The concept came to me after a reading of one of my plays at Scripteasers, a play reading group here in San Diego.” Tiger's plays have been produced from New York to New Zealand. The shirt's list of celebrated figures may be controversial because the sexual orientation of some individuals on the list may be in question by some historians. Leonardo DaVinci, Richard the Lion-Hearted and U.S. Founding Father, Alexander Hamilton, are among those described. The shirt may be seen at FamousGayShirt.com. A portion of the proceeds will benefit gay community causes and theater arts. 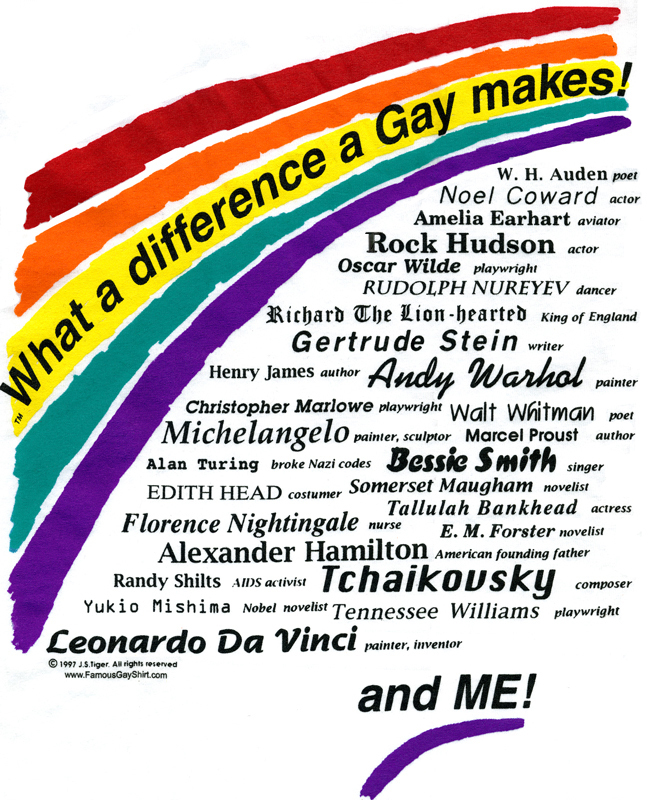 New T-shirt Celebrates 1,000 years of Gay History New T-shirt Design Spotlights 27 Gay Icons An instant history lesson of gay celebrities from Michelangelo to Florence Nightingale to Hollywood star Rock Hudson let you know "What a difference a Gay makes!". Some of the celebrities, such as Founding Father Alexander Hamilton may be controversial.